Canada's Tristen Chernove concluded the para-cycling track world championships with a gold medal in the men's C2 category scratch race on Saturday. 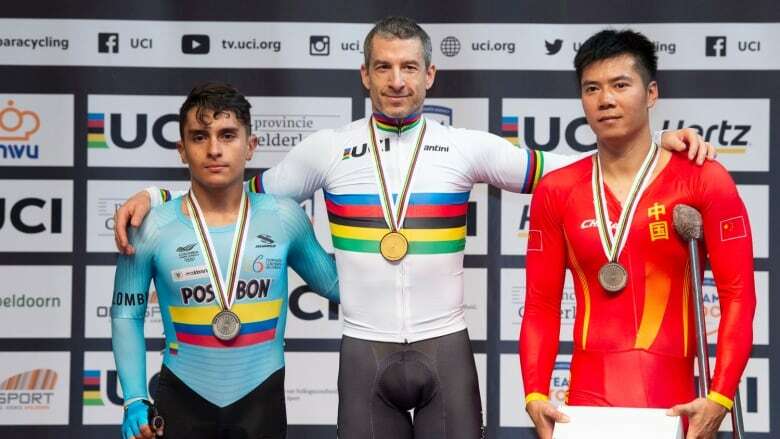 Chernove, 43, added to the silver he won in individual pursuit and the bronze he earned in the 1,000-metre time trial earlier at the event in Apeldoorn, Netherlands. He also topped the standings in the first-ever omnium, though no medals were awarded for the Paralympic test event. "To come away with a victory in the scratch, I feel thrilled. It was a great race that finished in a bunch sprint, and to take home the jersey for the scratch was my goal coming here," said the Cranbrook, B.C., native. "And to win the omnium was a bonus." On the women's side, Canada's Keely Shaw won her first ever world championships medal with a silver in the individual pursuit. The Saskatoon native finished only behind Australia's Emily Petricola, who set a world record in the event. "I really excited for the outcome," said Shaw. "I don't think any of us were expecting this." Canadian Marie-Claude Molnar just missed the podium fourth. Canada concluded the para-cycling track worlds with five medals — one gold, two silver and two bronze medals. The haul, including omnium events, tied Canada's best-ever result at the world championships. Sebastian Travers, the head coach of the para-cycling team, said the result was great to see. "Although we haven't put everything together for peak performances, I happy to see how everyone worked together as a team," said Travers. "We developed a four year mission plan following Rio and we continue to progress according to this plan. We are confident that this will lead to key performances in Tokyo 2020 ."